Ever since I was very young, I have been a huge fan of baking. 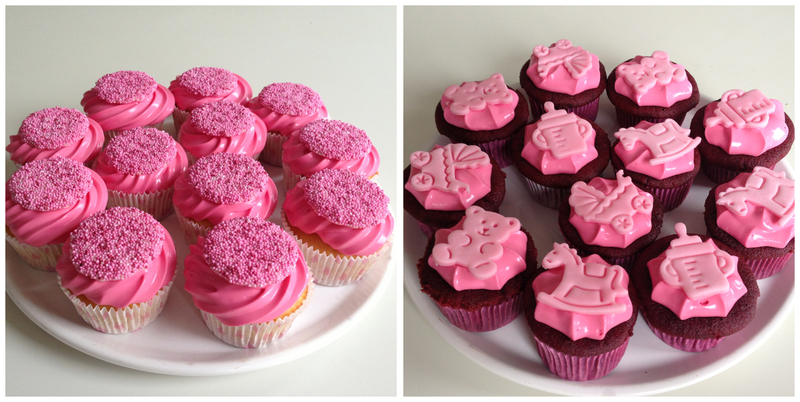 I enjoy baking all sorts of cakes, pies and cookies, but the last few years I have been really into making cupcakes. Although the rise in popularity of the cupcake seems to be declining again, I do not believe that the cupcake craze is totaly over and I doubt it ever will. For me, cupcakes are still the perfect party treat. Somehow these little cakes with their delicious and colorful frosting posses the power to make any party feel extra festive. Having one (or two) pretty cupcake(s) all to yourself just make you feel very special and spoiled, don’t you agree? 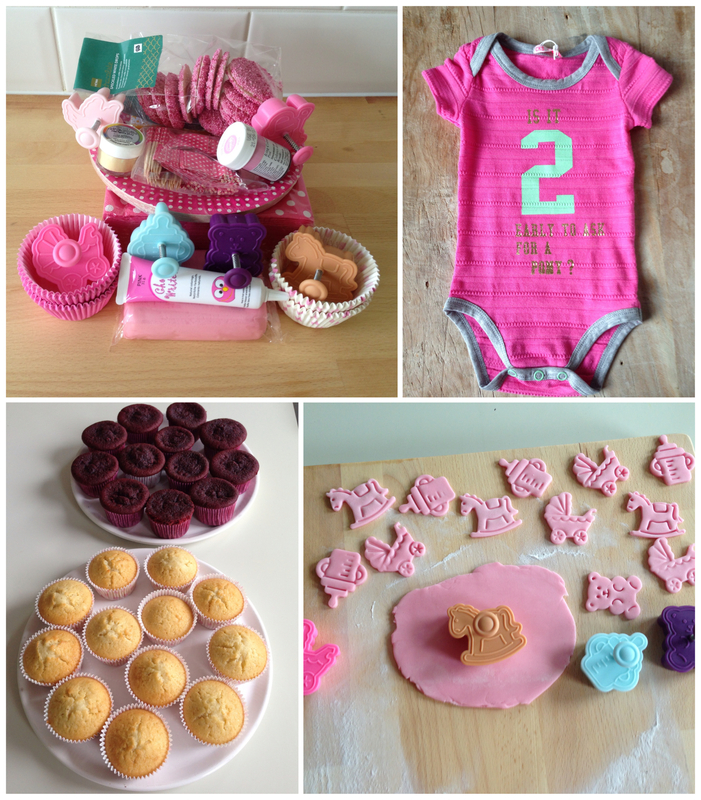 When I was recently asked to bake a cake for the baby-shower of my good friends, Aisha and Gijs, it did not take me long to decide that I would be making baby-themed cupcakes. Because they are expecting a little girl, I knew pink would have to be my color. I have made many different cupcakes over the years and my starting point for recipes has always been: http://www.joyofbaking.com This American website provides every baking and dessert recipe you can possible think of and offers clear and elaborate descriptions and videos. For this special baking-occasion I decided to make red velvet and lemon-vanilla cupcakes, but not before I stocked up on all the pink things I could possibly find. Although the taste and texture of the red velvet cupcakes was good, I felt like they could have risen a little bit more. Another thing I did not like about this recipe was that instead of making the promised 24, I only managed to squeeze out 15 out of the batter. I have made red velvet cakes before, but I have yet to find the perfect recipe. However I will not give up my search because red velvet is one of my all time favorite flavors. So, if you have the perfect recipe please let me know! The recipe for these delicious lemon-vanilla cupcakes on the other hand is a definite no-fail. I have made these several times now and I promise you that, if you stick to the recipe below, they will come out perfect. The original recipe does not call for lemon zest nor the seeds of a vanilla pod, but I think it makes the cupcakes taste a lot more special and interesting than an ordinary vanilla cupcake. Before you start baking I have one big recommendation; as opposed to cooking, there is absolutely no room for guesstimating when it comes to measuring ingredients for baking. Because few things are worse for moral than a failed baking-experiment, I suggest you regard this purchase as a vital investment for your mental well-being. Digital kitchen scales only cost about 15-20 euros nowadays and they make a big difference in your baking results. Preheat the oven to 180 degrees Celcius and line 12 muffin cups with paper liners. In the bowl of your electric mixer beat the flour, sugar, baking powder, and salt until combined. Add the butter, eggs, vanilla extract, and yogurt. Now beat the wet and dry ingredients together, at medium speed, until the batter is smooth and satiny, about 30 – 60 seconds. Scrape down the sides of the bowl and give it one more mix to make sure all the ingredients are combined properly. Evenly fill the muffin cups with the batter. I prefer to use an ice-scream scoop so that all the batter actually ends up in the paper liners. This scooping-method also ensures that you end up with cupcakes of approximately the same size. Bake for about 20 – 25 minutes or until lightly browned and a toothpick inserted into a cupcake comes out clean. I always like to cook my cupcakes as short as possible to ensure that they stay nice and moist inside. There is nothing worse than a dry (cup)cake. Once they are done, remove them from the oven and place them on a wire rack to cool. First beat the double cream to peaks. Beat the cream cheese in the bowl of your electric mixer until smooth. Add the vanilla and confectioners sugar and beat until smooth. Gradually add the heavy cream and whip until the frosting is thick enough to pipe. Add more sugar or cream as needed to get the right consistency. For the last step, add the food coloring one drop at a time. You really only need a few drops to get the right color. Place the frosting back in the refrigerator for at least 30 minutes to an hour to make sure it is really cold before you start piping. For the piping you will need a piping bag and a piping mouth. For these cupcakes I used a big size mouth but you can use whatever size or shape you think will look nice. If you do not own a piping bag, you can also use a spatula to cover the cupcakes, however this will not look as pretty. Piping does requires a little practice but once you master it, it is the most fun thing in the world! For making the cut-outs on top of the red velvet cupcakes I used rolled out pink fondant and baby-themed cookie cutters, that I have recently bought in Hong Kong, but if you use your imagination the possibilities are endless. Now all I need is for someone to have a baby boy, so I can make a blue version… I can not wait!